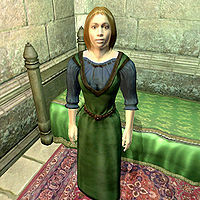 Marie Palielle, a Breton, is the resident healer at the Great Chapel of Julianos in Skingrad. She is something of a night-owl, sleeping from 10am until 4pm in her bed in the chapel's hall before heading towards the central aisle in the chapel, where she spends the rest of her time. During her time in the main chapel, Marie offers her services as a basic trainer of Restoration. She is so devoted to her duties that she never eats. Rumors around Skingrad show that other residents admire her dedication: "Marie Palielle seems very happy working at the chapel. She's always working, but she's always got a smile on her face." is one such rumor, and "Marie Palielle is quite a hard worker. She's in the chapel day and night, tending to the sick and injured." is another. Two shorter rumors convey real affection: "No one works harder than Marie." and "The world needs more folks like Marie." On first meeting the player Marie will say "Hello. We haven't met, have we? I'm Sister Marie Palielle, the chapel healer, and trainer in the Restoration Arts." and when asked about Skingrad, "The town is very nice, but I advise you get out and see the countryside... the vineyards and farms, pastures and sheepfolds. Lovely mountain country." Her only possessions are the clothes she wears, a blue and green outfit with a pair of quilted shoes, and a few gold coins. Marie knows a leveled set of healer spells, as well as one extra major Restoration spell. Marie has an AI package that should cause her to take a walk to the gate up to Skingrad Castle from 2pm to 4pm, but her sleep package overrides it meaning she spends her entire life in the chapel. Esta página foi modificada pela última vez à(s) 05h05min de 22 de dezembro de 2012.